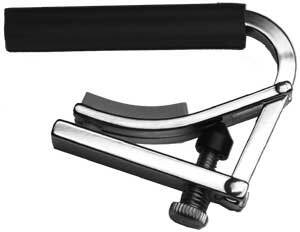 Since 1980 the Shubb capo has set the standard against which all others must be measured. It is the first choice ... often the only choice... of more than a million musicians worldwide. Once the serious guitarist has discovered the Shubb, he'll never settle for anything less. 2.25" and perfectly flat. Ideal for classical guitar, or any guitar with an absolutely flat fretboard.